When preparing a cheque, a lot of people forget to fill out something on a cheque. It is troublesome if the cheque cannot be drawn and bounced. Check list for writing a cheque. – Write the date on the cheque. – Fill in the name of the payee legibly and correctly. Write as close to “Pay” (the left) as possible. – Is it a bearer or cross cheque? Makes two diagonal lines on the top left corner for cross cheque. – Write the amount in words and keep the writing closely padded. Ensure you have the word “Only” at the end. – Fill in amount in figures. – Remember to sign the cheque. May be you need to have your company chop also. – Fill out the stub for record keeping. You can remember what the cheque is for. 1. If you made a mistake, you should clearly cross it out and give your full signature next to the change. 2. Write the cheque in ink permanently and ensure changes cannot be made afterwards. 3. Ensure the amount in words matches the amount in figures. 4. Verify your cheques again before presenting it. Actually, there is software which can help in preparing and printing cheque. ChequeSystem software can help avoiding any handwriting mistake. It can also keeps the cheque records automatically for future reference. Cheque Printing software has many useful feature helps you writing a cheque. 1. Auto set the current date for the cheque. You can adjust it if need. 2. 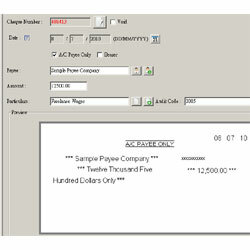 Payee name can be loaded from a pre-defined list. 3. Just type in the amount in number. The amount in words will be generated automatically. 4. Have checkbox to mark the cheque is crossed, bearer, etc. 5. The printing fits well and closely to avoid too much empty space left. 6. The software can also alert you if overdraw occurs. 7. The cheque records will be saved automatically. 8. Reports can give you a list of issued cheque with every details, include Date, Payee, Amount, and total lump sum. 9. Software can also save the recurring cheque template for later recall. If you need to write cheque for someone regularly, recurring cheque template is useful and you can recall it without typing everything again. You may visit ChequeSystem Cheque Printing software and see how easy and simple to prepare a cheque. how to write the cheque for 1.5 million in word.